You can walk up the hill to the Plancerts drag lift, discover Les Houches and ski home (snow allowing). A short drive down to town gives you access to the beautiful, glamorous St Gervais/Megève ski area, where you can mingle with the seasoned Alpine cognoscenti. Make sure you stop for an après-ski drink and a boogie at the legendary Folie Douce mountain bar above St Gervais. The École du Ski Français offers skiing lessons, with English-speaking instructors. Further information via www.ski-school-saint-gervais.co.uk or +33 4 50 47 76 21. Pur Bar for burgers and fried squid. Brasserie du Mont Blanc for copious and inexpensive food, but typically French service, so not one to choose if you're in a hurry. La Raviere: tiny and delicious family run restaurant, but difficult to find; a real hidden gem. Non-skiers can join you as it's easy to walk from the Les Communailles car park. Make sure you order chocolate cake with caramel salted butter for pudding. Wash down with Alsatian wine. Cash only – no cards. Book on 04 50 47 76 21. Our incredible tri-lingual mountain guide Raphael can come to the chalet in sunshine and snow by order to guide you in some amazing Alpine adventures, including hut-to-hut hikes, snow shoeing (half day, full day or 3-day). 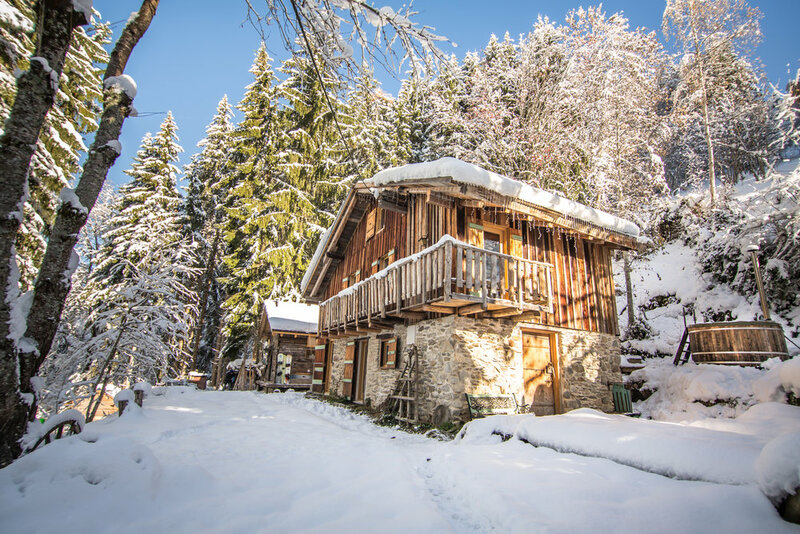 Heli-skiing is the classic choice, but more discerning guests should ask to be dropped at a mountain refuge, which are generally open from June to September. Book helicopter service on +33 6 81 60 81 04. Refuge de Nid d'Aigle (2412m at the edge of the Biomassey Glacier) is actually accessible by the Tramway du Mont Blanc railway, unlike the others, which are all a good hike. Refuge de Gouter has 120 beds in 8 dormitories: must be booked online www.refugedugouter.ffcam.fr and is the highest refuge in France (3385m). Telephone +33 6 72 81 22 08. Refuge de Miage has a little restaurant, 2 private bedrooms and 3 dormitories. Reserve via www.refugedemiage.com or +33 6 31 72 50 19. Vue Royale de Mont Blanc was re-done in 2005 and is comfortable and friendly. It is open in the winter but not necessarily manned; some camping is even allowed for the brave! Reservations via +33 6 19 02 90 71. We can help you to arrange your adventure. Contact us at Chillderness HQ. The famous Vallée Blanche in Chamonix is an off-piste ski route, 20km long with a vertical descent of 2700m starting from the Aiguille du Midi. The views are stunning and the high mountain environment provides a real sensation of wilderness. This is one of those memorable life experiences that you'll never forget. If the conditions are good, this wonderful and magnificent adventure trip is accessible, with a mountain guide, for most intermediate skiers and is a fantastic journey into the largest glaciated domain in the Alps, the Mont Blanc massif. About half-way down the Vallée Blanche, you can stop at the Requin Hut and have an excellent meal and drinks. When there isn't enough snow to come back to Chamonix on skis, it's much nicer and comfortable to stop at the Montenvers train station and take the train back down to Chamonix. There are a number of variants to the Vallée Blanche, requiring a little more skill and knowledge of the area. Involving steeper skiing over a more difficult terrain such as theGros Rognon, the Grand Envers and the Petit Envers du Plan. These routes are only recommended for advanced skiers with extensive off-piste experience or intermediates under the guidance of a high mountain guide. St Gervais has a great tourist office which has very up to date lists of all the attractions and restaurants in the area. www.saintgervais.com or telephone +33 45 47 76 08. There is also a market on Thursday mornings in the main square. In St Gervais town, if you are not in the mood for skiing, there is an ice skating rink, swimming pool, mini golf and tennis.